The City of Lipa is not exactly the most cosmopolitan of places. Thus, in three decades of coaching a high school football team along with about a decade of also mentoring a college team, the lads that I worked with were mostly homegrown Batangueños. This could be problematical because, contrary to what some people say, size does matter as well in football. It goes without saying that majority of the lads that I worked with were, kung sa manok, Tagalog. In the latter years, we had the occasional half-breed; either Philippine-born tisoys or the so-called Fil-foreigners who were born abroad but for one reason or the other ended up studying here. All that time, however, I only ever worked with just three full-blooded foreigners. Two played for the college team: a Nigerian and a South Korean. The last one was a Brazilian exchange student who was not even officially enrolled in the high school in the school year 2004-05 but was considered a ‘sit-in.’ His name was Caio Ricardo. And because he was from Brazil – where football is less of a sport and more of a religion – it was a matter of time before he asked to play with us. The curiosity, I suppose, was that he was first with the basketball team before he even came to the field. Standing a good few inches above six, Caio naturally towered over just about everyone in the school. At the football field, he made most of my players look like hobbits. Caio was this bubbly character who always wore a big grin on his Caucasian face. Although his English was limited, he immediately and remarkably got along well with everyone. In fact, he made himself right at home on the first day that he came to join scrimmage. Playing with him, however, was not necessarily easy. It was not as though he was not skilful. Rather, the way he used the ball was not what I and my boys would think of as conventional skill. In other words, he just had his own ways of using the ball and not necessarily the way we would. On the other hand, he was Brazilian. The ball always did as he wanted it to. Getting him to play within the context of a pattern was also not an easy thing to accomplish. First of all, communication with him was difficult because of his broken English. Because I spoke not one word of Portuguese, I pretty much left him to do things his way. That’s the second point. He had his own concept of the game, anyway; and was wont to do things his way rather than mine. He was such a good-natured person that I just tolerated this. Besides, he was not officially with the team because he was not enrolled. He just joined us for scrimmage every now and again because, as he said, he was Brazilian. He had to play football! When on certain occasions I needed my boys to practice playing patterns and asked Caio to wait on the sidelines till later, he would be standing there with his large eyes silently pleading. Sometimes he would beg outright to be sent in. Unless we were preparing for a big match, I usually relented. Fortunately for him, just a few months before the schoolyear was to end – and therefore before he flew back home to Brazil – we joined a tournament which allowed exchange students. The funny thing was that he was also playing for the basketball team; so would hop from one venue to another tirelessly. Where he got all that energy, I never did figure out. I had mostly juniors with me; so we really did not think our chances of winning the tournament were very high. 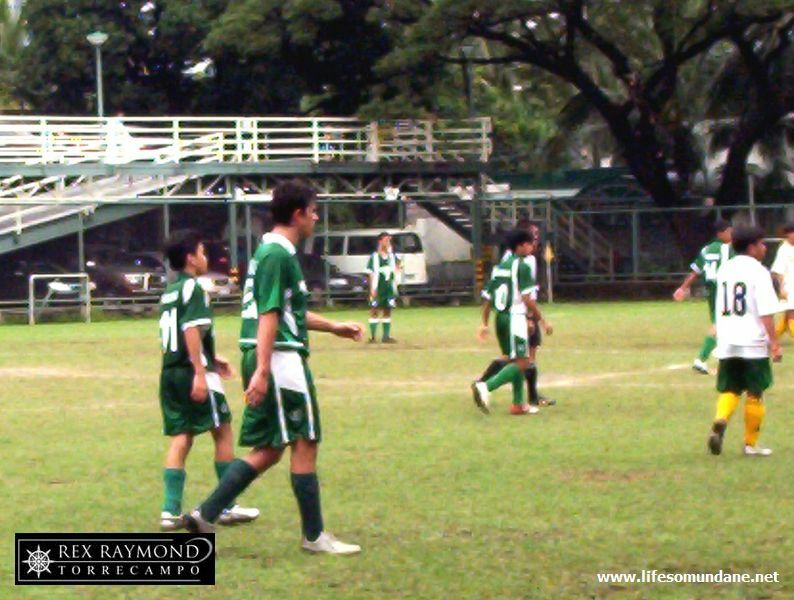 However, we won over a team from Bacolod because of the goals that Caio scored for us. The game plan was remarkably simple. The local boys would do all the hard work – since Caio was clueless about the patterns, anyway – and he was asked to stay as close to the opponent’s goal as possible as our tall striker. The Ilonggos would surround him sometimes as many as four players at a time whenever he received the ball. Because he was so big and strong, he held everyone off with remarkable ease. In fact, even 4-v-1 looked ridiculously lopsided in his favour! Before leaving, he asked for one of my green official team jerseys to bring home to Brazil as a souvenir, with the promise to send me one from his favourite Brazilian club. The promised jersey is yet to come; but I do not really mind. It is enough that there is a green jersey with my surname printed at the back somewhere in the great footballing nation that is Brazil. Imagine that!